It’s the Summer (Winter for some), mid-year and the time of hype and glory. Yes, it is once again time for Evolution Fighting Game Championship 2017, happening at Las Vegas, NV, USA. Throughout the weekend of July 14th to 16th at the Mandalay Bay, fierce competition of all fighting game titles and talents will be battling through to escape their pools and breakout their combos and hypers to the final boss stage of the glorious Mandalay Bay arena. Just like last year, the XSplit team is going to be sponsoring and powering the production staff of EVO with the help of the stream wizard himself, Yu Sheng “Farpenoodle” Tan and our product manager Victor “Spooky” Fontanez. In celebration of Evo, you can use the discount code “EVO2017” on our buy page for a 20% discount off any purchase. I will be there as a competitor myself and try to bring you all the hype and stories so make sure to follow us on our socials. 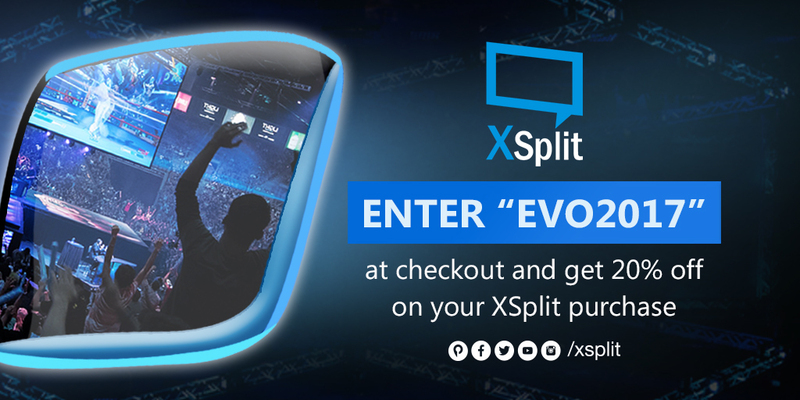 We at XSplit sincerely wish all the competitors from around the world to perform at their best as we will make sure to deliver your efforts, performance and emotions to the viewers at home, cheering for their favorite players. Our love and support will be always grateful towards the Fighting Game Community and we hope to achieve a respectful and heart-ful spot of being the broadcast supporter and partner of the global FGC of passionate individuals and organizations. Major shoutouts to the EVO and the Shoryuken team. Plus, if you’d like to reach out for any tips and advice for FGC-event productions, make sure to let us know as we’re always interested to share ideas and tools for XSplit products to be more esports and tournament friendly.